Pep Guardiola signed a deal to become Manchester City manager just two months into his final season with Bayern Munich, according to German magazine Der Spiegel. The claim was made in the magazine's latest revelations based on documents released by Football Leaks. According to Der Spiegel, Guardiola's original contract with City was dated October 10, 2015 - more than three months before the deal was announced on February 1, 2016. He began work in July 2016 after completing a three-year spell with Bayern. Der Spiegel on Wednesday published a third instalment of its series on Manchester City, all based on documents from Football Leaks. The magazine has alleged that City sought to circumvent Financial Fair Play rules as club owner Sheikh Mansour topped up sponsorship deals with Abu Dhabi-based companies with discrete payments. Der Spiegel has also claimed that City struck a deal with UEFA to avoid a Champions League ban when it was found they had breached FFP rules, and that a third-party company to which they sold player image rights was also funded by the Sheikh. City have not commented on the stream of claims beyond referring to a statement they issued last week which read: "We will not be providing any comment on out of context materials purportedly hacked or stolen from City Football Group and Manchester City personnel and associated people. The attempt to damage the club's reputation is organised and clear." 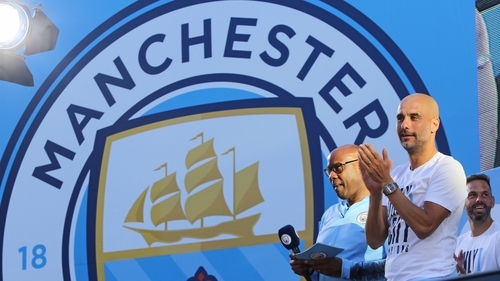 Some of City's sponsorship deals came under renewed scrutiny in Wednesday's instalment from Der Spiegel, which claimed that City remain sensitive to allegations of human rights abuse in the United Arab Emirates. The magazine cites a sponsorship deal done with Dubai-based construction company Arabtec, which had been implicated in alleged human rights abuses in a BBC report. Vicky Kloss, a spokeswoman for City, is said to have sent an email to team executives warning against the deal. "I think it's the biggest single risk to (our) reputation we have faced since 2008," she is said to have written. "The gap between what we (City) do and what they (Arabtec) do is unbridgeable." The three-year deal nevertheless went ahead in May 2014.